We love to send special cards to special people. We also love cards with badges and other things that you can keep, so started designing our own little items that people could enjoy and keep. 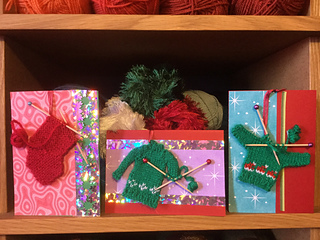 And what better scene than a seasonal knitty or crochet work in progress? 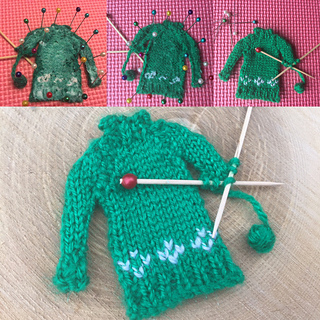 In this pattern, you will learn firstly how to make the sweater, and secondly how to create a card using your unique work. It also includes charts for two different sweater designs and guidance for colour work. Easily adaptable as a standalone item such as a brooch/badge or decoration. Introducing a few different techniques, this project is perfect for advanced beginner, intermediate or advanced knitters alike. 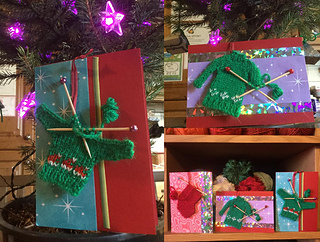 The more eagle-eyed of you may spot that one of the sweaters in the picture is a slightly different style e.g. it has raglan sleeves! This was the first design we went for which, while it looked good, is more difficult to explain in a pattern. For any mavericks who would prefer this style and are happy to wing it using minimal info, you can see a picture of the chart here. For more info, patterns and yarn chat, do join us on our blog yarnbuddies.wordpress.com We look forward to seeing you there!